Last month we helped 20,958 people who needed traffic school. More Info & Pricing | Returning Student? STRAIGHT FORWARD, ALL- INCLUSIVE PRICE! Our prices are fixed. We do not add surprise fees at check out. Just select the package that works for YOU. IMPROV® Traffic School is easy, fast and fun! We’re here 24/7 if you need any help. Let’s get you started TODAY! He’s here to help YOU! Select this course if you received a CA traffic ticket or were ordered by the court to attend traffic school and receive these FREE upgrades! Drivers education for a CA learners permit for new driver 16 – 18 years of age. Select this course if you were referred by your insurance company for Policy Discount / Mature Driver Program. Completing this program will earn a certificate you can turn in to your employer to prove you completed a defensive driving or driving improvement course. Completion will not be reported to the CA DMV and cannot be used for an insurance discount or to mask a traffic ticket. See why over 3 million students picked us as their #1 choice! Tickets happen to everyone - but we here at Improv® have your back! It's our mission to help you get through it with a smile. We are a fully licensed traffic school by the California DMV and are accepted by all CA Courts. Click to see our official license. 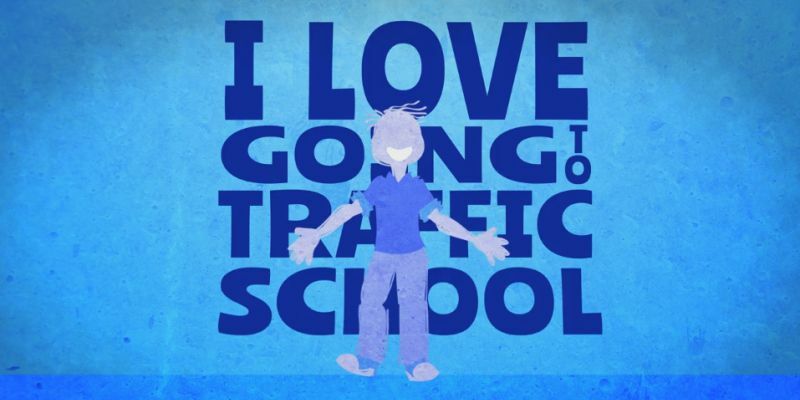 We've won countless awards from students and media alike, including "Best Traffic School". Click to see our reviews. Finish at your own pace. Your certificate will be processed within 30 minutes of completion. Rain, snow, or shine - our U.S. based support team is here 7 days a week to quickly answer any questions you may have. Click to chat with us now. Access your California traffic school course anywhere, anytime, and from any device. Our CA Traffic School was created in California in partnership with the World Famous Improv Comedy Club to make it Fun, Fast, and Effective. Improv Traffic School's unique edutainment courses have won copious accolades from students and the media, resulting in our being named Best Traffic School year after year. Only $34.95 $24.95 No Surprise Fees Ever! Improv Traffic School is proud to be licensed by the State of California to offer you a certified CA Online Traffic School. View our certification. "Traffic school designed with you in mind"
Complete at YOUR pace on YOUR time at YOUR place. Take advantage of our free express registration to get going in less than one minute. We are confident you will like the simplicity of our traffic school course, but want you to be your own judge. No commitment. No risk. Just sign up today, choose from a variety of a la carte options, and then make your payment. Enjoy your course right away. Proceed and complete the course all at once or a little at a time. There are 6 short chapters, simple 5-question review quizzes, and a 25-question exit quiz. Continue on any device at any time. We stand behind your satisfaction with a 100% Money Back guarantee. Completions are automatically and immediately electronically reported on your behalf to the CA DMV. Your CA traffic court will then apply your completion report to your case within 24 hours. Improv Traffic School was created with a single mission in mind, to offer you a fun and simple alternative to traffic school. Since then, we have helped over 3 million students and we would now love to help you. Still not convinced? See reviews from our customers. From students who took our Traffic School in California. This was really a fun way to learn. I learned a lot. Material was well prepared with good laughs and good examples. I have no complaints about the course. The info was provided in a straightforward and easy to digest manner. Big thumbs up! This traffic school was quite entertaining and easy to complete. I would definitely recommend this to all friends and family. The information is abundant but very well put. I am glad I did this traffic school. I became aware of many things I did not know. Very comprehensive. Very good course. With 30 years of driving experience I still learned some good tips and am confident I will be a better driver after taking this course. This was my first time getting a ticket, and having to complete traffic school. I feel that I learned a lot, it was a good refresher since I had my driver's license for more than 20 years! Not that I habitually get tickets, but this was the best traffic school I've used. The chapters were not horribly long and tedious, but reasonable and even interesting. The comedy was fun! This was great! I learned a lot and when driving now I'm really thinking about what is happening around me based on the ideas shared during the program. The information was informative, engaging, entertaining and most importantly raised my personal safety bar. Great online traffic school course. Quick and easy. Made would have been a very long and drawn out process a delightful one. Thanks for making Traffic School not an odious task. I have recommended your site to others, should they ever need to take Traffic School. The course material was easy to follow. I enjoyed the jokes and comedy video breaks. I would recommend this provider to others. Awesome traffic safety course. I learned some new things, brushed up on some old ones. I would definitely recommend taking your online class. The Improv Traffic School is easy to use, and they have a very easy to understand way of presenting the material. Their staff is always helpful. Improv Traffic School made it simple and interesting to go through the material. It reminded me of some driving precautions that I sometimes take for granted. Do I qualify for California Traffic School? More information to help you make the right choice. Your ticket involves a moving violation. The court offers a notice indicating possible eligibility for traffic school in California. If your driver's license is a noncommercial license and the court allows you to attend a California Traffic School for an eligible offense, it will change how the offense appears on your record. In this instance, once you complete the approved traffic school, you'll receive a confidential conviction. This means that the incident will appear on your driving record with the DMV; however you will not receive the point that hurts your driving record and causes insurance rates to soar. In certain circumstances, the court may offer traffic school as an option to drivers who have commercial licenses, but only if the offense occurred in non-commercial vehicles. In these instances, the conviction will appear on record with the DMV but the point, again, will not. It's important to note that if you do qualify to attend driver school and decide not to do so, your auto insurance rates may be negatively affected by that decision. Non-moving violations, such as parking. Offenses occurring under the influence of alcohol or other substances. Offenses occurring in commercial vehicles. You're also ineligible for traffic school if you've attended within the past 18 months for another approved offense. Other reasons exist that would exclude you from utilizing traffic violator school. You can find those in the California Rules of Court. The specific rule is: rule 4.104. You should consult with a qualified attorney if you were deemed ineligible for traffic school and believe you should be eligible. You should never, however, sign up for traffic school without court approval of traffic school attendance ahead of time. What happens when you decide to enroll in traffic school? If the court allows you the opportunity to attend traffic school, you must complete the course by the court required date as to not receive points on your record for the violation. People with non-commercial driver's licenses will receive confidential convictions on their DMV records, while those with commercial driver's licenses will receive a general conviction both without the corresponding point. You will be required to pay the ticket first, then an administrative fee to the court, as well as the traffic school fee for attendance. You must request permission from the court, by the ticket's due date, if you decide to attend traffic school without first going to court. Once you complete the course, the traffic school will let the DMV know so appropriate action on their end can be taken. How long does online traffic school take in California? CA online traffic school online can take anywhere from 30 minutes to over 8 hours. The course is designed to meet the CA DMV requirements for the 8-hour classroom course. However, because CA does not require the online course to be timed, most students finish it much quicker. Individuals can complete it at their own pace. It is completely up to them. How does online traffic school work in California? CA traffic school can be done online in the comfort of your own home, workplace or on-the-go by cell phone. The course is mostly reading, but there are some educational videos as well as videos for entertainment value only for the student’s viewing pleasure. Once the student completes the course, they are required to take a 25 question, multiple-choice quiz. They must get 18 out of 25 correct to pass the course and have their completion reported to the CA DMV. As long as the student provides the correct citation number, traffic court information and driver license; the student’s traffic court will apply the DMV report to their case, mask the ticket, and the point(s) will not go onto the student/driver's record. How to sign up for traffic school online in California? Signing up for online traffic school is simple. One can register themselves on a school’s website, or call the school and register over the phone. Approved online schools can be found here. The online course completion is reported to the CA DMV and court electronically by the school. The student doesn’t have to do anything else. Why to take traffic school? Taking traffic school has several benefits in California. One, if a driver is taking it to mask a traffic violation, then the conviction will be masked on the driving record and his or her insurance will not increase. Two, it will qualify most drivers for an insurance discount. Third, it teaches one to be a better driver and hopefully prevent future tickets and accidents. How Much Is A Speeding Ticket? How can I get my traffic ticket dismissed? How do I fight a traffic ticket in California? What is the best way to fight a DUI ticket in California? How much do ticket fines & penalties cost in California? How can I reduce points on my driving license in California? What are some common traffic ticket questions in California? How do I request a traffic school online? How do I enroll in traffic school? What do I need to know about San Diego speeding tickets?